Our Popular Newborn Photography Workshop is BACK! BLOG » Our Popular Newborn Photography Workshop is BACK! Our newborn photography workshop is happening again October 17th and 18th. "The workshop was exactly what my business needed! Not only did I learn a ton about newborn photography from the hands-on and model babies, but I got right to work creating a more profitable and successful business based on all your suggestions. My first real sale after the workshop paid for the workshop - plus some! I had so much fun I want to take the workshop again. Thank you for everything. " "I enjoyed the flow of the two days. Starting out with the business stuff followed by taking us through what you actually do on shoot day was perfect. Taking your workshop gave me the push I needed to really kick [my business] off." We'd love the chance to do the same for you and your newborn business! 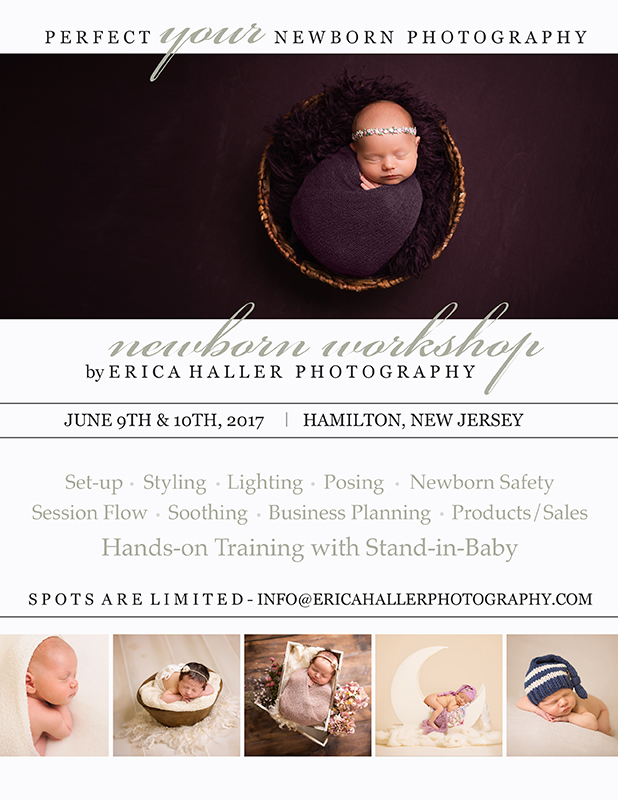 Bring your newborn photography to the next level with this one of a kind Newborn Workshop by Erica Haller Photography. Newborn photography requires unique and complex skills, above and beyond standard camera expertise. Successfully working with babies requires mastering the skills of baby soothing, newborn safety, technical posing elements, session flow and more. Strengthening your abilities in these foundational areas of newborn photography will allow you to open the door to endless creativity and individuality in your newborn work. Let us help you build this foundation and bring your newborn art to the next level. I have nearly a decade of professional photography experience, and newborn photography is my favorite niche. Pursuing my passion, I’ve studied under the industry’s top newborn photographers and traveled the country to work with the best of the best. Spots are limited, so call us at 609.903.2001 or email info@ericahallerphotography.com now to grab your place in this exciting workshop. We are excited to have hands on opportunities for you to master posing and wrapping with the Stand-In Baby. Plus, there will be lots of goodies, give-a-ways and discounts from our favorite vendors and workshop sponsors! The total tuition for the two-day workshop is only $875. A $250 non-refundable deposit is required to hold your spot and the balance is due by October 1st. Need more information? Just call or email for travel information and a list of local hotels. Contact us today or sign up here.